I thought I would get some acupuncture done this weekend to see if it would transform my nervous energy to bliss. It did not happen, got to the clinic and it was packed, I even had an appointment and it did not matter. I was rather angry seeing it was a 30+ minute drive. So I asked for a refund and headed over to the Delta Humane Society thrift store and bought a few things, hung out with kittens and people who love cats. To bust me out of my funk more Matt decided we needed doughnuts at Family Donuts & Deli again. The selection was smaller this time around but there were still some great ones to choose from. 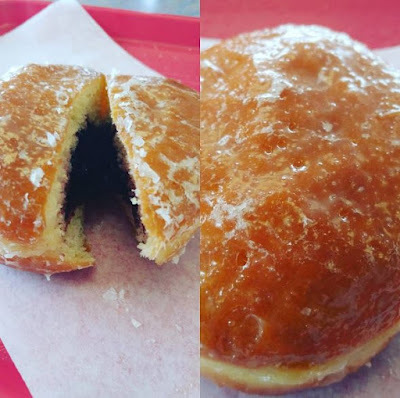 We tried a blueberry jelly filled and it was tasty! We rounded out the day having dinner at El Papagayo. 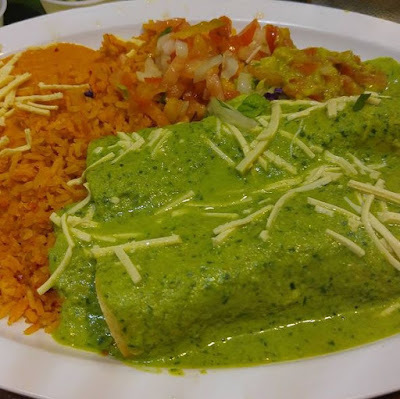 I had green enchiladas - one with fried tofu and the other with chili colorado - both tasty options. This leads me to VeganMOFO - I would totally take Mr. President to eat here. No way am I going to cook and fill myself with anxiety! I would get him stuffed with nachos from the salsa bar, get him a round of Tecate and tell him to try a fried tofu dish! I love that you can go inside the mausoleums! We don't have that here. When I was a kid I would ride my bike around all the villages and always stopped at churches to look at gravestones and try to find the oldest one. I live near a graveyard now, and it's so badly looked after. Many of them around here have been untouched for years and are overgrown with plants covering all the gravestones. Kind of sad. Those enchiladas look incredible, love how green the sauce is! That doughnut looks soooo good! And your cemetery exploration sounds like such a great expedition! 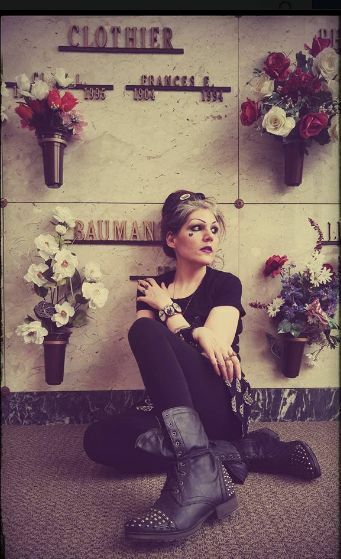 Kittens, donuts and mausoleums sound way more therapeutic than acupuncture. You could become a specialist helping anxious taphophiles with soothing cemetery tours and vegan sweets, that and tombstone calisthenics, seriously Kendy there's an untapped market here! :D Is the smoke from forest fires? I've heard they're pretty bad in Nor Cal. someday i hope to get to teach yoga in a cemetery! i like the idea of having vegan picnics before of after!